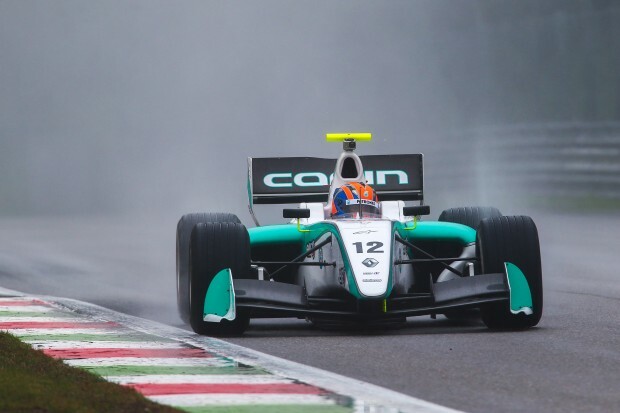 Jazeman Jaafar began his Formula Renault 3.5 Series (FR3.5) campaign with a strong opening round at the Monza circuit, finishing third in the Rookie class and an impressive seventh overall in the first race of the season. His fortunes were reversed in the second race, after being punted from behind by Zoel Amberg which punctured a rear tyre and forced him to pull off track and retire. Jazeman’s weekend began with two test sessions at the Monza track and he made good use of the time to acclimatise himself to the circuit and develop the car set up for the race weekend. He posted third quickest lap in the first session and was 14th fastest in the second session. The qualifying session for race one was held in wet conditions and all the drivers opted for the wet weather tyres to start the session. As the track dried many teams, including Carlin, moved to the dry tyre, but were unable to improve on their times. A solid effort from Jazeman put him 11th on the grid for the first race, the fourth quickest rookie in the field. The PETRONAS Talent Programme driver made a good start for the first race and slotted into 10th place at the end of the first lap. He then overtook Andre Negrao for ninth position, then benefited from drivers ahead making mistakes to lie fifth by half distance. He was caught in the thick of the action as the laps counted down, attacking Oliver Webb ahead of him, whilst also defending hard from a chasing Nigel Melker. Jazeman resisted the challenge until he started to struggle with his tyres which let Melker through and then Arthur Pic in the closing stages. He crossed the line in a highly creditable seventh place for his first FR3.5 race. The qualifying session for the second race was again held in wet conditions and Jazeman finished 18th fastest, to line up in this position for the second race. He made a brilliant start, making up six places in the first lap to lie in 12th position, dropping back to 13th after a bold move by Mihai Marinescu. But on lap 6 Jazeman was hit from behind by Zoel Amberg which punctured his right rear tyre so he was unable to continue and had to pull off the track and retire the car. Jazeman said of his weekend, “The first race was good and I enjoyed being able to battle with the cars around me, running at a good pace and experiencing running with a full grid of cars in anger for the first time. Scoring points on my first outing was my goal and I achieved this, so it was a good start. Jazeman will resume his FR3.5 racing programme on 27/28th April with the second event of the nine round series taking place at Motorland Aragon in Spain.